My youngest daughter drew this cute and playful unicorn one afternoon on our driveway with her sidewalk chalk. Her artwork lasted several days before an afternoon rain washed it away. But what fun it was for those few days to see the brightly colored unicorn galloping across the driveway each evening when I came home from work. In response to the Daily Post’s Folly. In response to the Daily Post’s Weekly Photo Challenge Fun!. This is a close up of a bud on the fig tree in the backyard. You can see the “velvetiness” on the young newly opened leaf. Soon, more buds will sprout……more leaves will fill the branches. Then the fruit will come and grow and ripen. That’s the expectation. That’s what’s supposed to happen. But what if it doesn’t. he enables me to tread on the heights. There’s nothing like a good friend. You can be yourself………..but if you’re not, she notices. You can share the deepest parts of you. She knows your story and you know hers. With her, it’s okay to not be okay. She’ll let you be scared but help you be brave. Your laugh makes her laugh. Your tears break her heart. It always feels like yesterday, even when it’s been a long time since you’ve connected. She makes you better because she lifts you up and she loves you. She’s an original and so are you. When I stop to take a photo it’s because something about what I’m seeing has to be captured. And most of the time it’s not just one thing. It’s the whole of it. A shed and a greenhouse in the middle of a lush field on a hot July evening. No filters or edits needed. The rosy sky and the emerald field. The tall grass in the foreground and the trees in the back. And the magnificent sun settling down. The beauty is overwhelming, the colors astounding……and I get to see things like this every day if I will just look. I was walking on my country roads when I took this photo. My old country roads where I used to live. I was probably tired from a day’s work with more to do when I finished my walk. Whatever my mood when I started, I was in a better one when I was through. Because I’m in awe. And grateful. And I pray I never get used to this. and the skies announce what his hands have made. night after night they tell it again. they have no voice to be heard. their words go everywhere on earth. The sky is like a home for the sun. The sun comes out like a bridegroom from his bedroom. It rejoices like an athlete eager to run a race. and follows its path to the other end. Nothing hides from its heat. An unseasonably warm day of winter here in North Alabama gets me outside to explore the yard. 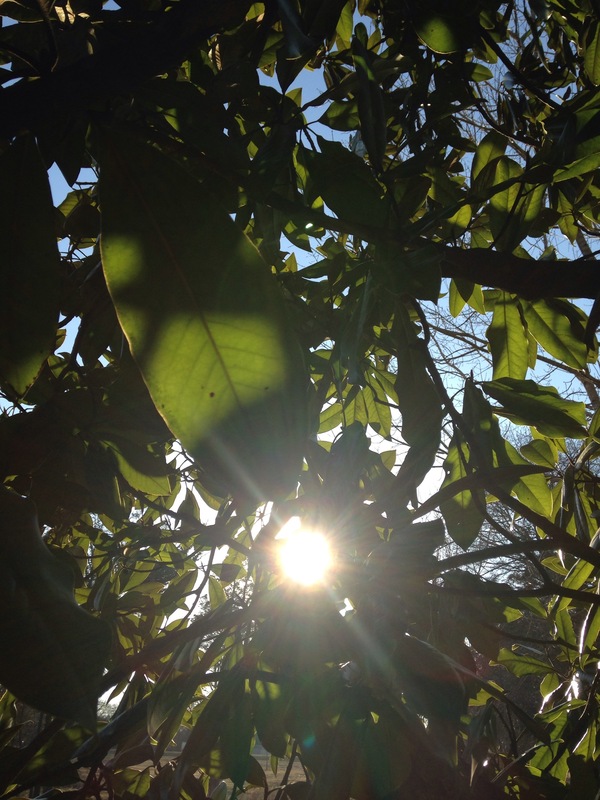 The sun shines through the leaves of this beautiful magnolia tree. I can’t remember when Dad planted this tree. It must have been a long time ago because magnolias are slow to grow and this one is a good size. I do remember the day I pulled up for a visit and Dad was about to cut the tree down. I asked him not to and here it is now….filtering the sun through its waxy green leaves in a beautiful pattern onto the ground below. It will stay here and grow taller, slowly taller and wider. And I will think of Dad often because of this magnolia tree. In response to the Daily Post’s Weekly Photo Challenge Seasons. When I was a little girl I wondered over the rays of sunshine and how they shone down from the sky, sometimes in lines, like when clouds were in its way. I could have stared at the the moon and stars all night. I was amazed at the changing seasons, thunderstorms and rainbows, butterflies, and the wind. I loved the trees and their shadows, the big rocks in our woods, and the creek that trickled there. Dandelions and bumblebees and lizards and roses. I still wonder at God’s creation. Something always catches my eye when I’m outside. Like this okra plant on a late summer day. Or like this unnamed plant. I think it’s a weed because it grows in abundance on the fence line in the field by our home. Or these bright yellow green Mimosa tree pods. In response to the Daily Post’s Weekly Photo Challenge Vibrant. 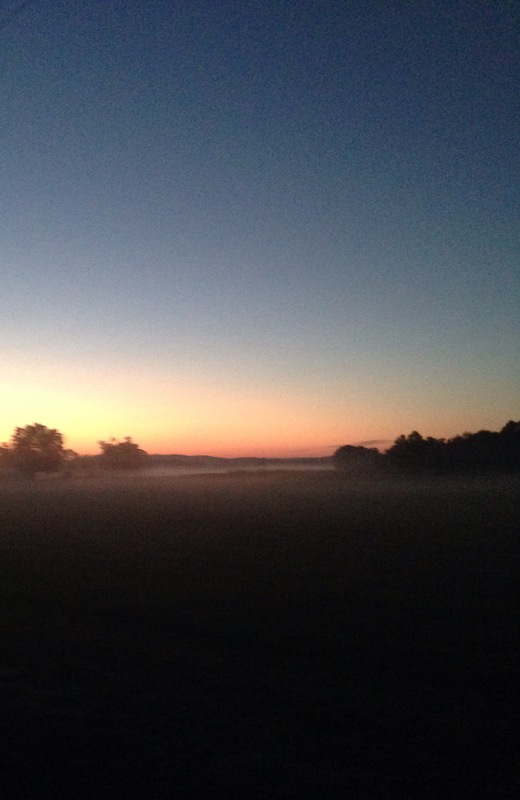 I’ve always loved morning time. It’s my time…….mostly. Recently I started running in the mornings. I begin when it’s dark but by the time I’m finished the sun is peeking over the edge of the small hills on my country road. A sunrise is another beginning. Another chance. Another day to love and laugh and cry. Another day to live like it matters. A sunrise could be the start of a brand new way of living. It brings a whole bunch of new opportunities. It could bring laughter and joy and forgiveness. And healing and compassion. 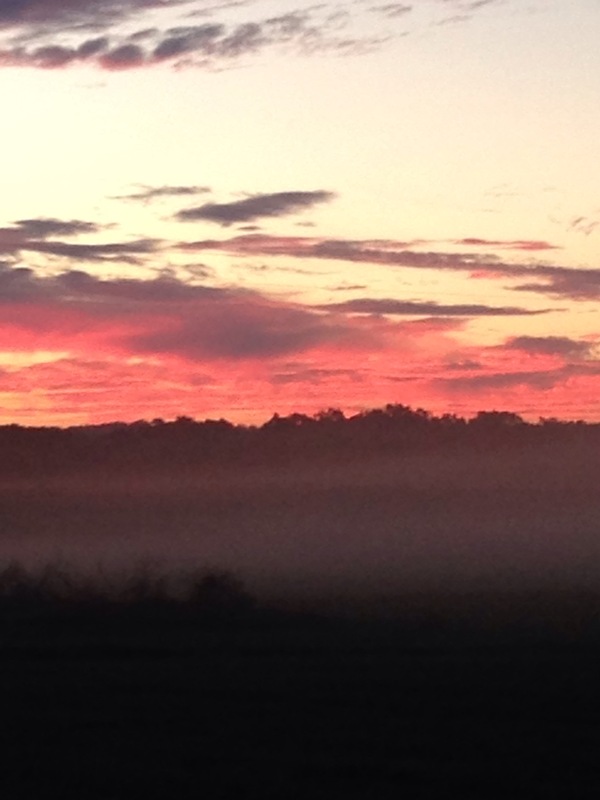 A sunrise is hope rising and light shining into our darkest seasons. Since I’ve begun this new thing I’ve seen more beautiful sunrises in the past 6 months than I have my entire life. The sunrises have been there all along. I just wasn’t there to see them. I don’t want to miss anymore sunrises. In response to the Weekly Photo Challenge Ascend. In response to the Daily Post’s Weekly Photo Challenge Alphabet. This photo was taken in a hurry. I barely stopped to take the photo because the people on Beale Street were moving at a certain pace and I felt the need to keep up. 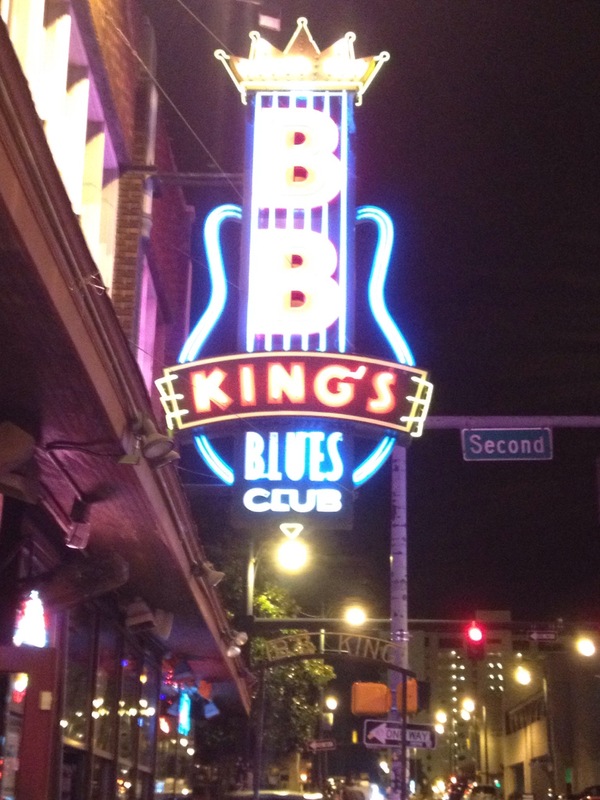 BB Kings Blues Club is where we sat and listened to some of the best music ever, ate a wonderful meal, and laughed our faces off. Well not off…..we still have our faces, but you know what I mean. Last weekend my husband and I, with two other couples went to Memphis, Tennessee for a night. This was out of the ordinary for all of us because sometimes we let the responsibilities of life crowd out the “just for fun” part of life. All of us have full-time jobs and families. Juggling work, raising families, running small businesses, renovating a home, and all other sorts of happenings in our lives, cause us to forget the importance of spending time with friends. Last weekend we got away from all the “must do’s” of our lives and enjoyed some time together. We enjoyed the music and food. The lights and activity on Beale Street were exciting. But the laughter we shared was the best part of all. Laughter is like a balm for a wearied soul. It’s healing and soothing. I encouraged it in my Live Like it Matters Challenge a few months ago in my post called Laugh. Laughter can also be contagious. Do yourself and all those around you a favor today and laugh. Then do it again tomorrow, and the next day, and the next. This photo was taken on an extraordinarily beautiful day in September. Septembers are normally hot and humid here in North Alabama but this day was more like a mild Spring day. 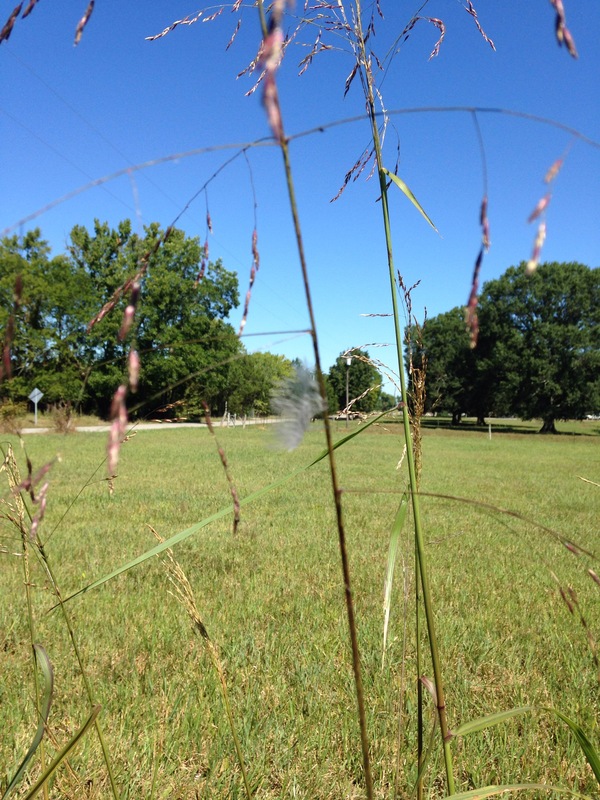 I noticed a tiny feather stuck on a long blade of grass. A baby bird probably lost it when he took flight from the nest in the nearby bushes along the fence line. The wind tried to blow the feather loose but the feather held on until, at last, a stronger gust caused the feather to lose its grip and it was free. It flew upward then floated softly back down, then up again and down again, up then down. I’ve dreamed of flying or floating since I was young. I don’t have wings when I fly in my dreams, but sometimes I have a colorful inner tube around my waist. One of my favorite dreams I have often is when I can jump high and stay suspended in the air, like I’m floating almost. Like the feather. Up quickly then softly floating back down. Up then down again. In response to The Daily Post’s Weekly Photo Challenge Transient.